The arsonist who set fire to a home in Maryland with two women inside meant to target someone else, sources say. The suspect, who investigators say is a gang member, had the wrong address, according to sources. "He destroyed our lives," victim Natasha Lasley said. She and her sister were inside their house on the 11500 block of Dunloring Drive in Largo, Maryland, when flames tore through it. Firefighters responded about 12:30 p.m. Monday. 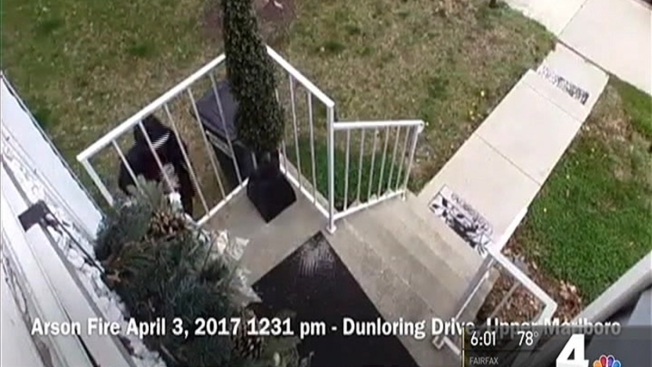 Surveillance footage from a camera mounted on the house shows a man carrying a red gas can and flames leaping from the deck to the roof. At one point, the arsonist appears to look right at the camera. Investigators believe he strategically set the fire so it would climb up the house and build in strength before it triggered the smoke detectors inside. Aaron Christopher Davis, 28, was arrested Tuesday and charged with attempted murder and arson. Information on his lawyer was not available immediately. Wearing borrowed clothes, Lasley spoke as she picked through her charred belongings. She lost everything, and she and her sister could have lost their lives. "His intent was to kill anyone in that house," she said. "It could have been me and my sister. That's a nightmare that we always will have." By the time firefighters arrived at the scene, all three levels of her home had caught fire. Additional firefighters were called to the scene when the flames began to spread to adjacent homes. Eight adults and a child were displaced, and two firefighters were treated for minor injuries. The fire caused an estimated $320,000 in damage. Neighbor Genie Hebron said she's afraid. "It's scary to me because if he or if his gang members realize they've targeted the wrong home, are they going to come back and get the right home?" she asked. Fire investigators are still looking for information about this incident and any additional suspects. Anyone with information that can help is asked to call the Arson Tip Line at 301-772-7766. A GoFundMe account has been set up to help Lasley and her family.